What is “Key Lime” pie? What makes an authentic key lime pie? Do “key” limes actually exist? As I’m currently vacationing in the key lime pie capital of the country- Florida – it seems a good opportunity to let go of more academic pursuits and explore these (not so) pertinent questions. And, since many of the two of you that read this blog are still in climates that refuse to recognize the arrival of spring, I feel it is really my public service duty to try to enjoy the sun, go to the beach, and taste as many variations of this pie as possible, reporting back on my findings. It’s a tough job, but someone has to do it. While no one seems to know for sure, historians believe the pie is a creation of Key West fishermen in the mid to late 1800s, and that the condensed milk was born of necessity – there was no fresh milk or refrigeration in Key West until the 1930s. As for key limes themselves, they arrived in Key West via the Spanish in the 1500s, who brought them over from Malaysia. However, a hurricane wiped out the key lime trees in 1926, and they were replaced by easier to pick Persian limes. There is still a spattering of key lime trees in Florida, but the fruit doesn’t usually leave the area. So the truth is that “key” limes are just a cruel marketing ploy. Be wary of anyone advertising key limes or time shares. There is a fair amount of argument on what constitutes authentic key lime pie (though apparently nobody cares that key limes aren’t actually used these days). Whipped cream or meringue topping, graham cracker crust or pastry, frozen or custard filling – these are all options. But all experts agree that the pie should, under no circumstances, contain food coloring to give it a greenish hue. Key lime pie is supposed to be yellow, god dammit. Unfortunately none of this information is particularly helpful when trying to determine criteria for a “best” key lime pie, so I guess I’ll have to go with general food excellence mixed with personal preference as the basis for my Best Key Lime Pie Contest judging this week. 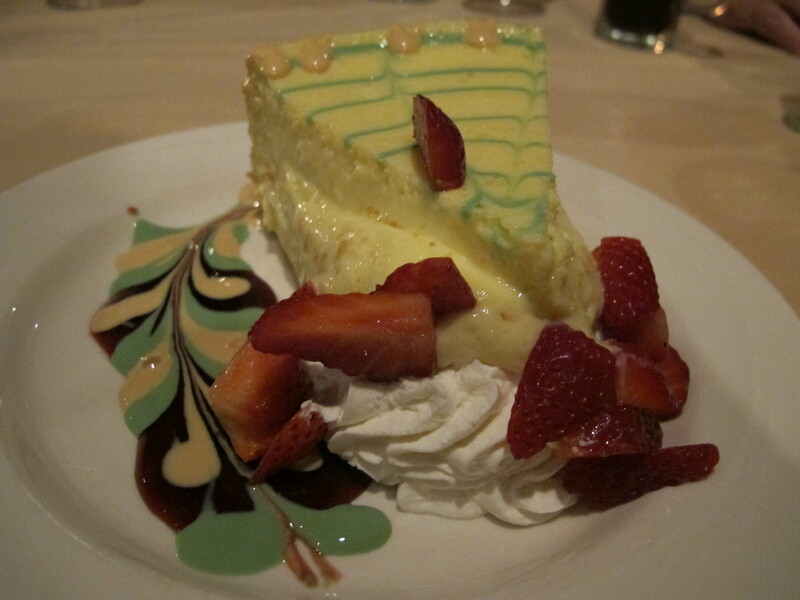 House-made Key Lime Pie from The Sunset Grill. Stay tuned for more hard-won findings on key lime pie, perhaps a decision on what makes the “best” version, and hopefully even a recipe or two. Voila.